Enter a realm of e-scapism and sound-scapism. For many years now, Netherlands-based artist Mark Stolk has travelled the world of soundscaping, developing a hardware-driven vision of continuous sound and creative instrumentation that he calls Mystahr. His broad variety of sound sources often seems to go diverging directions, reflecting his viewpoint that nothing ever stays the same; the world around us, and indeed nature itself, erode and evolve through chaos. That very chaos has become a fundamental element in Mystahr's work, its sheer beauty always enticing the listener, its unpredictability always keeping the listener's direct attention. Rummaging through the experimental debris of such diverse sounds, sounds that may occasionally seem unbearable, he has made a profound discovery: amidst this chaos hides a calm. Pursuing that calm both in music as well as in life, Mystahr quests on, ever restless. Just as he searches for the ultimate sound, so he continues his love for obscure and ancient gear. 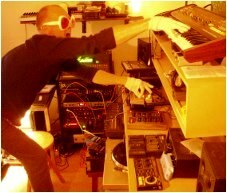 His obsession with older machines and vintage gear has taken over even his home, which has been "eaten up" by all this electronica. Mark would have it no other way. Not only is Mark very active as an artist but he also contributes back to the community as the brains behind experimental netlabel Just Not Normal as well as the host of a prominent weekly radio program called NTNS Radio. Earth Mantra is excited to bring you the boundary-pushing music of Mystahr. We invite you to immerse yourself in his unique and visionary sound worlds.